The Planning Scheme Area of the FLN NDA is about 165 ha and will accommodate a total population of 74,100 and provide about 6,800 job opportunities upon full development. The distribution of new housing units in the FLN NDA is around 70:30 in public and private housing developments. 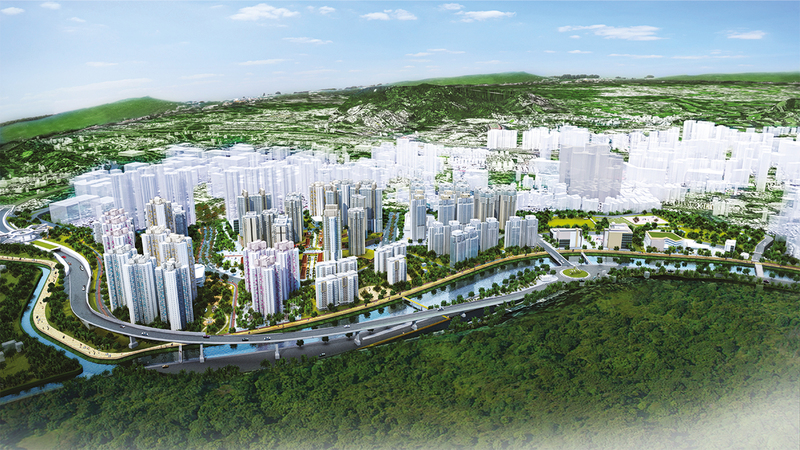 Located right next to Ng Tung River with a succession of grassy, hilly terrain to the north, the FLN NDA is proposed to be developed as a ‘Riverside Community’ making the best use of its beautiful riverside scenery and hilly backdrop to create a comfortable living environment with a mix of residential, retail and services and agricultural uses, community and government facilities. Two district nodes with a mix of residential use, retail, social and community facilities, PTI and public open space are planned in the eastern portion to the immediate north of the existing market town of Luen Wo Hui and in the western portion to the north of Tin Ping Shan Tsuen respectively to serve as major activity nodes of the FLN NDA. 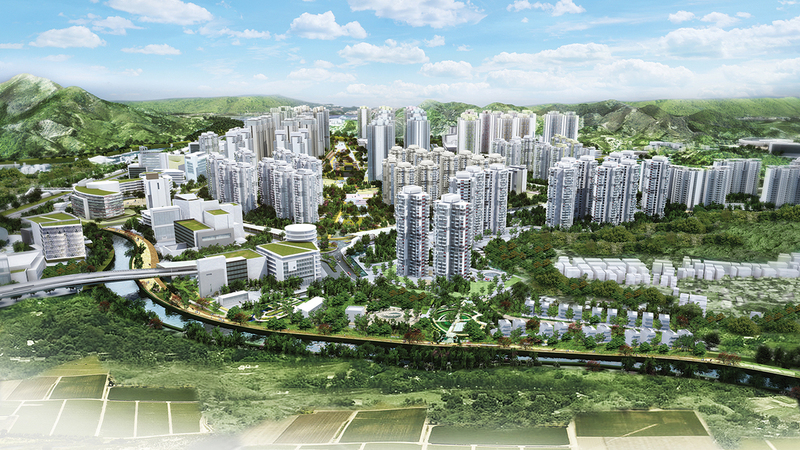 To create a social and recreational hub easily accessible by the future residents and the existing communities in Fanling/ Sheung Shui New Town, the current Shek Wu San Tsuen area, which is centrally located, will be developed into the Central Park with social welfare and recreational facilities in the vicinity, forming the civic core of the area. 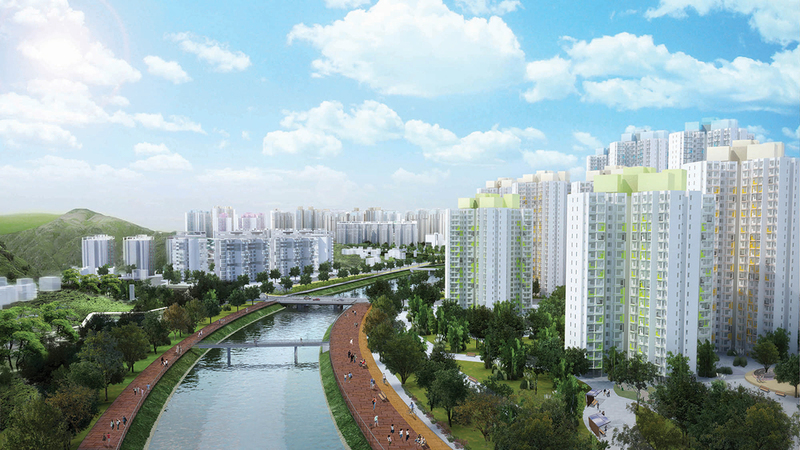 The north-western portion of the NDA is planned for government uses, including police training facilities and expansion for Shek Wu Hui Sewerage Treatment Works. About 12 ha of land for agricultural use at Fu Tei Au is retained. Four green spines stretching from Fung Kai Secondary School, Tin Ping Shan Tsuen, Luen Chit Street and Wo Tai Street to the two district nodes are planned to provide easy access for pedestrians between the Fanling/ Sheung Shui area and the NDA. A comprehensive cycle track network is also planned with linkages to major activity nodes in the FLN NDA as well as to the existing cycle track network in the Fanling/ Sheung Shui area and the proposed cycle track network in the KTN NDA to provide convenient connections for the local communities. A cruciform pedestrian shopping street with 2-storey terraces on both sides lined with retail shops, cafés and restaurants is planned in the major north-south and east-west running open space corridors in the eastern District Centre to promote street vibrancy. The FLN NDA has a comprehensive network of recreation and green spaces comprising regional, district and local open spaces. Other urban design elements, e.g. 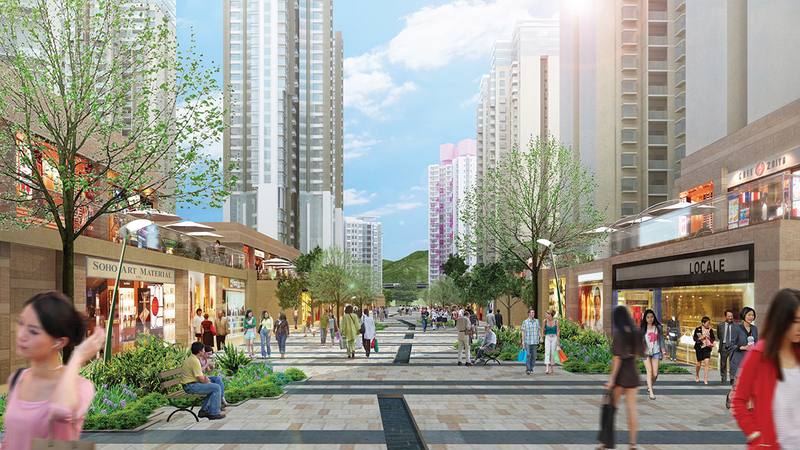 stepped building height and provision of view corridors and breezeways, were adopted for the NDA developments.